Is ‘regulatory capture’ as powerful and unpreventable as the informed consensus suggests? Regulatory capture happens when a regulatory agency, formed to act in the public’s interest, eventually acts in ways that benefit the industry it is supposed to be regulating, rather than the public. When regulations (or lack thereof) seem to detract from the common good, critics often point to regulatory capture as a culprit. In some academic and policy circles it seems to have assumed the status of an immutable law. Yet for all the ink spilled describing and decrying capture, the concept remains difficult to nail down in practice. Regulatory capture is not always and everywhere the devastating problem it is often made out to be. In some cases, good ‪‎regulation‬ does prevail, in spite of the special interests. But what exactly does this imply? If we know that capture doesn’t affect all regulation equally, is it possible to translate this truism into a deeper understanding of capture – of how to prevent it before it occurs and how to detect and eliminate (or at least mitigate) it where it is found? 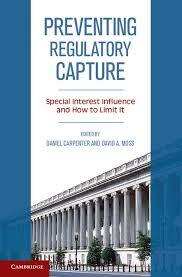 This comprehensive and thorough volume Preventing Regulatory Capture: Special Interest Influence and How to Limit it, edited by Daniel Carpenter & David A. Moss (Harvard University) represents a first step toward answering these questions, by bringing together seventeen scholars from across the social sciences. Their work shows that capture is often misdiagnosed and may in fact be preventable and manageable. Focusing on the goal of prevention, the volume advances a more rigorous and empirical standard for diagnosing and measuring capture, paving the way for new lines of academic inquiry and more precise and nuanced reform. This entry was posted in Books and tagged interest groups, policy, regulation, regulatory capture, Regulatory State, state. Bookmark the permalink.